Alton Towers' newest rollercoaster was forced to close when the wheels on The Smiler became loose and hit riders sat on the front row. Speaking to the Daily Mail, a spokeswoman for the theme park in Staffordshire said it was shut on Saturday afternoon following a "technical issue". She said the small, plastic guide wheels "were caught beneath the track in the safety netting, but regrettably several were flicked into the guests sitting in the front row of the train". "Two of the guests were attended to by Park staff and all four remained on park for the rest of the afternoon." The BBC reports that an investigation will be carried out to decide if the ride could re-open. 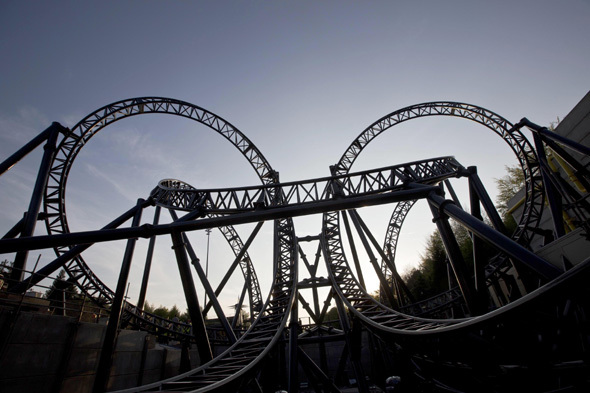 In May, the £18million rollercoaster's launch was delayed due to "teething problems". Visitors were left stranded mid-air on the 14-loop ride while previewing it and the theme park owners decided to postpone its official opening. The ride was closed in July after visitors heard a "massive clanging sound" and saw a metal bar on the ground nearby. The rollercoaster was shut for four days and 48 people had to be rescued. It closed again in August due to a "technical issue". With a 127ft head-first drop straight under the wing of a genuine plane wreckage, followed by gut-wrenching near misses that take you terrifyingly close to a flaming fire truck, rotating helicopter blades and the walls of a life-size church, The Swarm is Europe's tallest winged roller coaster, and Thorpe Park's newest attraction. Swings aren't scary, right? Wrong. How do you fancy one that reaches speeds of up to 50mph and 3G force? Sky Ride - the fastest swing in Europe - recently opened at Tree Top Adventure in North Wales. It's Europe’s first five-seater giant swing, elevated 80ft above the Conway Valley. Adrenaline seekers are suspended above the tree tops before being released to soar back and forth, with their feet dangling as the rush hits. Sky Ride is the highest swing-based ride of its kind in the UK. According to legend, stars of the silver screen stayed at the Hollywood Tower Hotel during the golden age of Hollywood. But the story goes that in 1939, five guests were riding in the Hotel's maintenance service elevator when lightning struck the building - and they were never seen again. You can still see scorch marks on the exterior of the building. Only brave souls ride the Twilight Zone Tower of Terror at Disney's Hollywood Studios Theme Park. Balder, at Liseberg Amusement Park in Sweden's Gothenburg, is one of the largest wooden roller coasters in the world and reaches speeds of up to 90km an hour. Ferrari World in Abu Dabhi is world’s largest indoor theme park. Created around the classic double-curve body shell design of a Ferrari car, the park features over 20 rides and attractions, including the world’s fastest rollercoaster, Formula Rossa, which powers to 240 kmh in less than five seconds, and requires riders to wear safely goggles. When it opened in 1996, Megafobia was Europe's largest wooden roller coaster. But you'll have to take a trip on this fast turning, heart tumbling, wild wooden roller coaster to find out why it's been voted the best ride in the UK, and the third best ride in the world. Tree Top Adventure in the heart of Snowdonia in Wales is home to the world's highest Powerfan parachute simulator, the Powerfan Plummet. Thrill-seekers can scale a height of 106ft for a panoramic view, before plummeting to the ground aided by revolutionary new technology which ensures a feather light landing. The Tower of Power at Siam Park, Costa Adeje in Tenerife offers the ultimate adrenaline rush. The 28 metre-high drop features a nearly vertical slide and a jaw-dropping drop at a speed of around 25mph. If that doesn’t seem enough, the ride then propels any brave takers through a clear underwater flume set in a giant tank... filled with sharks. The Phoenix is a famous wooden roller coaster located at the Knoebels Amusement Resort in Elysburg, Pennsylvania. When it opened in 1947, the Phoenix was the largest roller coaster in the world, with 3200 feet of track and a 78ft hill. Gulp. At Busch Gardens in Tampa Bay, Florida, North America's first dive coaster takes you 200ft up then hurtles you 90 degrees straight down at speeds of up to 70mph. There's nothing above you but air, and nothing below you but the ground.